Using a creative tool, in this instance a camera, English and the power of nature, our early evening explorative photography class along the shoreline of their beach with the students of Bido was magnetic. For nearly all students it is a novelty to use a camera seeing the world through a new lens. A camera is a wonderful way to explore and absorb what’s around from a new angle, gaining new insights. Taking a picture on the same level as a crab scurrying along the shoreline; following the line of plastic rubbish strewn on the high tide mark. Combining this with using a new language causes a pause, a reflection and from it come questions, realisations and ideas. Looking at the photos students have taken back in the classroom, students are fascinated by what they have captured and perhaps have opened another part of who they are. 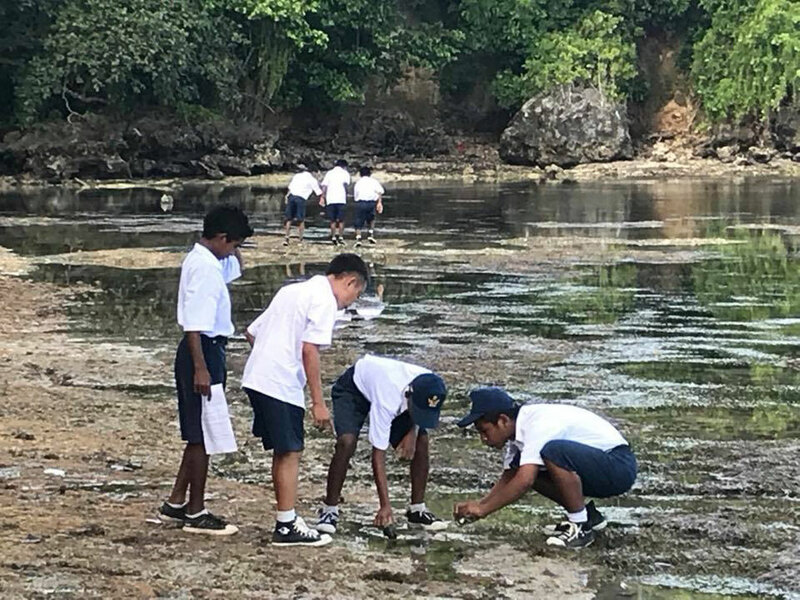 Talking about the problem of plastic in oceans when the plastic is at your feet and students are taking photos of it at their beach is proving powerful. Step two is devising a system to clean the beach regularly and finding a method to dispose of it while trying to reduce it’s use. Power of emotion and connection to your environment brings action.